Anthem: "Veillons au salut de l'Empire"
A map of the First French Empire at its greatest extent in 1812. 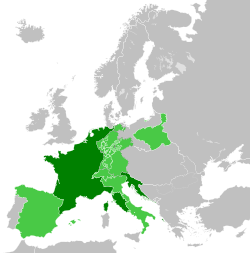 The First French Empire, officially the French Empire (French: Empire Français),Note 1 was the empire of Napoleon Bonaparte of France and the dominant power in much of continental Europe at the beginning of the 19th century. Although France had already established an overseas colonial empire beginning in the 17th century, the French state had remained a kingdom under the Bourbons and a republic after the Revolution. Historians refer to Napoleon's regime as the First Empire to distinguish it from the restorationist Second Empire (1852–1870) ruled by his nephew as Napoleon III. On 18 May 1804, Napoleon was granted the title Emperor of the French (L'Empereur des Français, pronounced [lɑ̃.pʁœʁ de fʁɑ̃.sɛ]) by the French Sénat and was crowned on 2 December 1804, signifying the end of the French Consulate and of the French First Republic. The French Empire achieved military supremacy in mainland Europe through notable victories in the War of the Third Coalition against Austria, Prussia, Russia, and allied nations, notably at the Battle of Austerlitz in 1805. 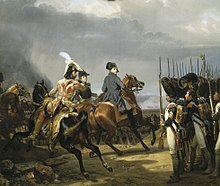 French dominance was reaffirmed during the War of the Fourth Coalition, at the Battle of Jena–Auerstedt in 1806 and the Battle of Friedland in 1807. A series of wars, known collectively as the Napoleonic Wars, extended French influence to much of Western Europe and into Poland. At its height in 1812, the French Empire had 130 departments, ruled over 70 million subjects, maintained an extensive military presence in Germany, Italy, Spain, and the Duchy of Warsaw, and counted Prussia and Austria as nominal allies. Early French victories exported many ideological features of the French Revolution throughout Europe: the introduction of the Napoleonic Code throughout the continent increased legal equality, established jury systems and legalised divorce, and seigneurial dues and seigneurial justice were abolished, as were aristocratic privileges in all places except Poland. France's defeat in 1814 (and then again in 1815), marked the end of the Empire. In 1799, Napoleon Bonaparte was confronted by Emmanuel Joseph Sieyès—one of five Directors constituting the executive branch of the French government—who sought his support for a coup d'état to overthrow the Constitution of the Year III. The plot included Bonaparte's brother Lucien, then serving as speaker of the Council of Five Hundred, Roger Ducos, another Director, and Talleyrand. On 9 November 1799 (18 Brumaire (VIII under the French Republican Calendar)) and the following day, troops led by Bonaparte seized control. 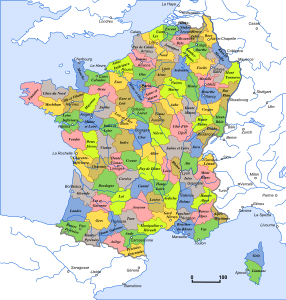 [clarification needed] They dispersed the legislative councils, leaving a rump legislature to name Bonaparte, Sieyès and Ducos as provisional Consuls to administer the government. Although Sieyès expected to dominate the new regime, the Consulate, he was outmaneuvered by Bonaparte, who drafted the Constitution of the Year VIII and secured his own election as First Consul. He thus became the most powerful person in France, a power that was increased by the Constitution of the Year X, which made him First Consul for life. The Battle of Marengo (14 June 1800) inaugurated the political idea that was to continue its development until Napoleon's Moscow campaign. Napoleon planned only to keep the Duchy of Milan for France, setting aside Austria, and was thought[by whom?] to prepare a new campaign in the East. The Peace of Amiens, which cost him control of Egypt, was a temporary truce. He gradually extended his authority in Italy by annexing the Piedmont and by acquiring Genoa, Parma, Tuscany and Naples, and added this Italian territory to his Cisalpine Republic. Then he laid siege to the Roman state and initiated the Concordat of 1801 to control the material claims of the pope. When he recognised his error of raising the authority of the pope from that of a figurehead, Napoleon produced the Articles Organiques (1802) with the goal of becoming the legal protector of the papacy, like Charlemagne. To conceal his plans before their actual execution, he aroused French colonial aspirations against Britain and the memory of the 1763 Treaty of Paris, exacerbating British envy of France, whose borders now extended to the Rhine and beyond, to Hanover, Hamburg and Cuxhaven. Napoleon would have ruling elites from a fusion of the new bourgeoisie and the old aristocracy. 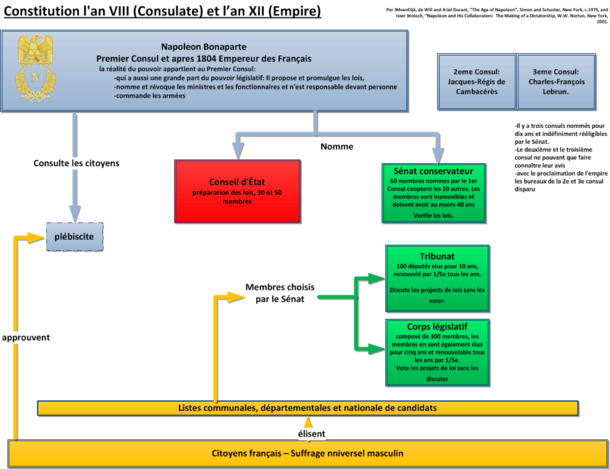 On 12 May 1802, the French Tribunat voted unanimously, with the exception of Carnot, in favour of the Life Consulship for the leader of France. This action was confirmed by the Corps Législatif. A general plebiscite followed thereafter resulting in 3,653,600 votes aye and 8,272 votes nay. On 2 August 1802 (14 Thermidor, An X), Napoleon Bonaparte was proclaimed Consul for life. 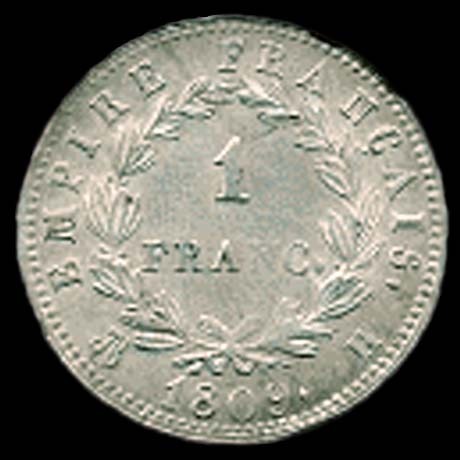 Pro-revolutionary sentiment swept through Germany aided by the "Recess of 1803", which brought Bavaria, Württemberg and Baden to France's side. William Pitt the Younger, back in power over Britain, appealed once more for an Anglo-Austro-Russian coalition against Napoleon to stop the ideals of revolutionary France from spreading. In four campaigns, the Emperor transformed his "Carolingian" feudal republican and federal empire into one modelled on the Roman Empire. The memories of imperial Rome were for a third time, after Julius Caesar and Charlemagne, used to modify the historical evolution of France. Though the vague plan for an invasion of Great Britain was never executed, the Battle of Ulm and the Battle of Austerlitz overshadowed the defeat of Trafalgar, and the camp at Boulogne put at Napoleon's disposal the best military resources he had commanded, in the form of La Grande Armée. 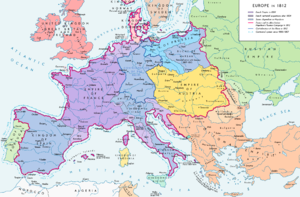 In the War of the Third Coalition, Napoleon swept away the remnants of the old Holy Roman Empire and created in southern Germany the vassal states of Bavaria, Baden, Württemberg, Hesse-Darmstadt and Saxony, which were reorganized into the Confederation of the Rhine. The Treaty of Pressburg, signed on 26 December 1805, extracted extensive territorial concessions from Austria, on top of a large financial indemnity. Napoleon's creation of the Kingdom of Italy, the occupation of Ancona, and his annexation of Venetia and its former Adriatic territories marked a new stage in his Empire's progress. To create satellite states, Napoleon installed his relatives as rulers of many European states. The Bonapartes began to marry into old European monarchies, gaining sovereignty over many nations. Joseph Bonaparte replaced the dispossessed Bourbons in Naples; Louis Bonaparte was installed on the throne of the Kingdom of Holland, formed from the Batavian Republic; Joachim Murat became Grand-Duke of Berg; Jérôme Bonaparte was made son-in-law to the King of Württemberg; and Eugène de Beauharnais was appointed to be the King of Bavaria while Stéphanie de Beauharnais married the son of the Grand Duke of Baden. In addition to the vassal titles, Napoleon's closest relatives were also granted the title of French Prince and formed the Imperial House of France. Met with opposition, Napoleon would not tolerate any neutral power. On 6 August 1806 the Habsburgs abdicated their title of Holy Roman Emperor in order to prevent Napoleon from becoming the next Emperor, ending a political power which had endured for over a thousand years. Prussia had been offered the territory of Hanover to stay out of the Third Coalition. With the diplomatic situation changing, Napoleon offered Great Britain the province as part of a peace proposal. This, combined with growing tensions in Germany over French hegemony, Prussia responded by forming an alliance with Russia and sending troops into Bavaria on 1 October 1806. In this War of the Fourth Coalition, Napoleon destroyed the armies of Frederick William at Jena-Auerstedt. Successive victories at Eylau and Friedland against the Russians finally ruined Frederick the Great's formerly mighty kingdom, obliging Russia and Prussia to make peace with France at Tilsit. The Treaties of Tilsit ended the war between Russia and the French Empire and began an alliance between the two empires that held power of much of the rest of Europe. The two empires secretly agreed to aid each other in disputes. France pledged to aid Russia against Ottoman Turkey, while Russia agreed to join the Continental System against the British Empire. Napoleon also forced Alexander to enter the Anglo-Russian War and to instigate the Finnish War against Sweden in order to force Sweden to join the Continental System. More specifically, the Tsar agreed to evacuate Wallachia and Moldavia, which had been occupied by Russian forces as part of the Russo-Turkish War of 1806–1812. The Ionian Islands and Cattaro, which had been captured by Russian admirals Ushakov and Senyavin, were to be handed over to the French. In recompense, Napoleon guaranteed the sovereignty of the Duchy of Oldenburg and several other small states ruled by the Tsar's German relatives. The treaty removed about half of Prussia's territory: Cottbus passed to Saxony, the left bank of the Elbe was awarded to the newly created Kingdom of Westphalia, Białystok was given to Russia, and the rest of Polish lands in the Prussian possession were set up as the Duchy of Warsaw. Prussia was ordered to reduce their army to 40,000 and to pay an indemnity of 100,000,000 francs. Observers in Prussia viewed the treaty as unfair and as a national humiliation. Talleyrand had advised Napoleon to pursue milder terms; the treaties marked an important stage in his estrangement from the emperor. After the Treaties of Tilsit, instead of trying to reconcile Europe, as Talleyrand had advised, Napoleon wanted to defeat Britain and complete his Italian dominion. To the coalition of the northern powers, he added the league of the Baltic and Mediterranean ports, and to the bombardment of Copenhagen by a Royal Navy fleet he responded by a second decree of blockade, dated from Milan on 17 December 1807. The application of the Concordat and the taking of Naples led to the first struggles with the Pope, centered around Pius VII renewing the theocratic affirmations of Pope Gregory VII. The Emperor's Roman ambition was made more visible by the occupation of the Kingdom of Naples and of the Marches, and by the entry of Miollis into Rome; while Junot invaded Portugal, Joachim Murat took control of formerly Roman Spain, whither Joseph Bonaparte transferred afterwards. Napoleon tried to succeed in the Iberian Peninsula as he had done in Italy, in the Netherlands, and in Hesse. However, the exile of the Royal Family to Bayonne, together with the enthroning of Joseph Bonaparte, turned the Spanish against Napoleon. After the Dos de Mayo riots and subsequent reprisals, the Spanish government began an effective guerrilla campaign, under the oversight of a local Juntas. The Peninsula became a war zone from the Pyrenees to the Straits of Gibraltar and saw Imperial Armies facing the remnants of the Spanish Army, as well as British and Portuguese Forces. Dupont capitulated at Bailén to General Castaños, and Junot at Sintra, Portugal to General Wellesley. Spain used up the soldiers needed for Napoleon's other fields of battle, and they had to be replaced by conscripts. Spanish resistance affected Austria, and indicated the potential of national resistance. The provocations of Talleyrand and Britain strengthened the idea that Austrians could emulate the Spaniards. On April 10, 1809, Austria invaded France's ally, Bavaria. The campaign of 1809, however, would not be nearly as long and troublesome for France as the Spanish one. After a short and decisive action in Bavaria, Napoleon opened up the road to Vienna for a second time. At Aspern-Essling, Napoleon suffered his first serious tactical defeat, along with the death of Jean Lannes, an able Marshall and dear friend of the Emperor. The victory at Wagram, however, forced Austria to sue for peace. The Treaty of Schönbrunn, 14 December 1809, annexed the Illyrian Provinces and recognized past French conquests. The Pope was forcibly deported to Savona, and his domains were incorporated into the Empire. The Senate's decision on 17 February 1810 created the title of King of Rome, and made Rome the capital of Italy. 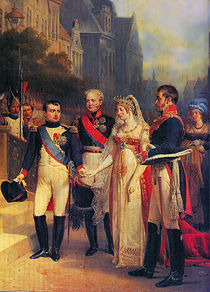 Between 1810 and 1812 Napoleon's divorce of Joséphine, and his marriage with Archduchess Marie Louise of Austria, followed by the birth of the king of Rome, shed light upon his future policy. He gradually withdrew power from his siblings and concentrated his affection and ambition on his son, the guarantee of the continuance of his dynasty. This was the high point of the empire. Undermining forces, however, had already begun to impinge on the faults inherent in Napoleon’s achievements. Britain, protected by the English Channel and its navy, was persistently active, and rebellion of both the governing and of the governed broke out everywhere. Napoleon, though he underrated it, soon felt his failure in coping with the Spanish uprising. Men like Baron von Stein, August von Hardenberg and Johann von Scharnhorst had secretly started preparing Prussia's retaliation. The alliance arranged at Tilsit was seriously shaken by the Austrian marriage, the threat of Polish restoration to Russia, and the Continental System. The very persons whom he had placed in power were counteracting his plans. With many of his siblings and relations performing unsuccessfully or even betraying him, Napoleon found himself obliged to revoke their power. Caroline Bonaparte conspired against her brother and against her husband Murat; the hypochondriac Louis, now Dutch in his sympathies, found the supervision of the blockade taken from him, and also the defense of the Scheldt, which he had refused to ensure. Jérôme Bonaparte lost control of the blockade on North Sea shores. The very nature of things was against the new dynasties, as it had been against the old. After national insurrections and family recriminations came treachery from Napoleon's ministers. Talleyrand betrayed his designs to Metternich and suffered dismissal. Joseph Fouché, corresponding with Austria in 1809 and 1810, entered into an understanding with Louis and also with Britain, while Bourrienne was convicted of speculation. By consequence of the spirit of conquest Napoleon had aroused, many of his marshals and officials, having tasted victory, dreamed of sovereign power: Bernadotte, who had helped him to the Consulate, played Napoleon false to win the crown of Sweden. Soult, like Murat, coveted the Spanish throne after that of Portugal, thus anticipating the treason of 1812. The country itself, though flattered by conquests, was tired of self-sacrifice. The unpopularity of conscription policies gradually turned many of Napoleon’s subjects against him. Amidst profound silence from the press and the assemblies, a protest was raised against imperial power by the literary world, against the excommunicated sovereign by Catholicism, and against the author of the continental blockade by the discontented bourgeoisie, ruined by the crisis of 1811. Even as he lost his military principles, Napoleon maintained his gift for brilliance. His Six Days Campaign, which took place at the very end of the Sixth Coalition, is often regarded as his greatest display of leadership and military prowess. But by then it was the end (or "the finish"), and it was during the years before when the nations of Europe conspired against France. While the Emperor and his holdings idled and worsened, the rest of Europe agreed to avenge the revolutionary events of 1792. Napoleon and his staff during the War of the Sixth Coalition, 1812–14, by Jean-Louis-Ernest Meissonier. Napoleon had hardly succeeded in putting down the revolt in Germany when the Tsar of Russia himself headed a European insurrection against Napoleon. To put a stop to this, to ensure his own access to the Mediterranean and exclude his chief rival, Napoleon made an effort in 1812 against Russia. Despite his victorious advance, the taking of Smolensk, the victory on the Moskva, and the entry into Moscow, he was defeated by the country and the climate, and by Alexander's refusal to make terms. After this came the terrible retreat in the harsh Russian winter, while all Europe was concentrating against him. Pushed back, as he had been in Spain, from bastion to bastion, after the action on the Berezina, Napoleon had to fall back upon the frontiers of 1809, and then—having refused the peace offered to him by Austria at the Congress of Prague (4 June–10 August 1813), from a dread of losing Italy, where each of his victories had marked a stage in the accomplishment of his dream—on those of 1805, despite Lützen and Bautzen, and on those of 1802 after his defeat at Leipzig, when Bernadotte—now Crown Prince of Sweden—turned upon him, General Moreau also joined the Allies, and longstanding allied nations, such as Saxony and Bavaria, forsook him as well. Following his retreat from Russia, Napoleon continued to retreat, this time from Germany. After the loss of Spain, reconquered by an allied army led by Wellington, the rising in the Netherlands preliminary to the invasion and the manifesto of Frankfort (1 December 1813) which proclaimed it, he had to fall back upon the frontiers of 1795; and then later was driven yet farther back upon those of 1792—despite the brilliant campaign of 1814 against the invaders. Paris capitulated on 30 March 1814, and the Delenda Carthago, pronounced against Britain, was spoken of Napoleon. The Empire briefly fell with Napoleon's abdication at Fontainebleau on 11 April 1814. After a brief exile at the island of Elba, Napoleon escaped, with a ship, a few men, and four cannons. The King sent Marshal Ney to arrest him. Upon meeting Ney's army, Napoleon dismounted and walked into firing range, saying "If one of you wishes to kill his emperor, here I am!" But instead of firing, they went to join Napoleon's side shouting "Vive l'Empereur!" Napoleon recaptured the throne temporarily in 1815, reviving the Empire in what is known as the Hundred Days. However, he was defeated by the Seventh Coalition at the Battle of Waterloo. He surrendered himself to the Coalition and was exiled to Saint Helena, a remote island in the South Atlantic, where he remained until his death in 1821. 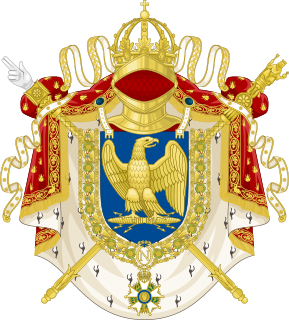 After the Hundred Days, the Bourbon monarchy was restored, with Louis XVIII regaining the throne of France, while the rest of Napoleon's conquests were disposed of in the Congress of Vienna. Napoleon gained support by appealing to some common concerns of French people. These included dislike of the emigrant nobility who had escaped persecution, fear by some of a restoration of the Ancien Régime, a dislike and suspicion of foreign countries that had tried to reverse the Revolution—and a wish by Jacobins to extend France's revolutionary ideals. Napoleon attracted power and imperial status and gathered support for his changes of French institutions, such as the Concordat of 1801 which confirmed the Catholic Church as the majority church of France and restored some of its civil status. Napoleon by this time however was not a democrat, nor a republican. He was, he liked to think, an enlightened despot, the sort of man Voltaire might have found appealing. He preserved numerous social gains of the Revolution while suppressing political liberty. He admired efficiency and strength and hated feudalism, religious intolerance, and civil inequality. Enlightened despotism meant political stability. He knew his Roman history well, as after 500 years of republicanism, Rome became an empire under Augustus Caesar. Although a supporter of the radical Jacobins during the early days of the Revolution (more out of pragmatism than any real ideology), Napoleon became increasingly autocratic as his political career progressed and once in power embraced certain aspects of both liberalism and authoritarianism—for example, public education, a generally liberal restructuring of the French legal system, and the emancipation of the Jews—while rejecting electoral democracy and freedom of the press. Map of the "First French Empire in 1812, divided into 133 départements, with the kingdoms of Spain, Portugal, Italy and Naples and the Confederation of the Rhine, Illyria and Dalmatia"
Europe in 1812, with the French Empire at its apogee before of the Russian Campaign. 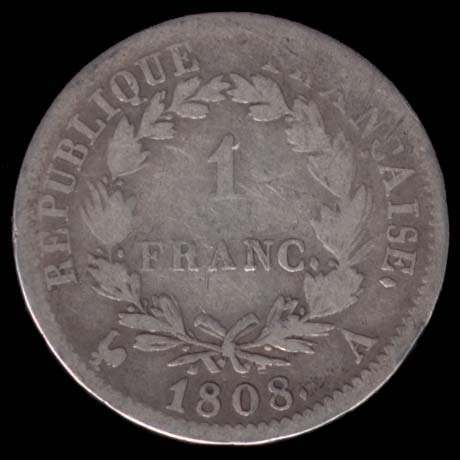 ^ Domestically styled as French Republic until 1808: compare the French franc minted in 1808  and in 1809, as well as Article 1 of the Constitution of the Year XII, which reads in English The Government of the' Republic is vested in an Emperor, who takes the title of Emperor of the French. ^ According to his father's will only. 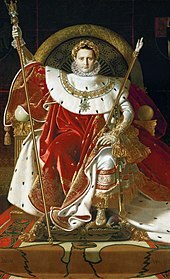 Between 23 June and 7 July France was held by a Commission of Government of five members, which never summoned Napoleon II as emperor in any official act, and no regent was ever appointed while waiting the return of the king. ^ Claims that Napoleon seized the crown out of the hands of Pope Pius VII during the ceremony—to avoid subjecting himself to the authority of the pontiff—are apocryphal; the coronation procedure had been agreed upon in advance. See also: Napoleon Tiara. ^ Rein Taagepera (September 1997). "Expansion and Contraction Patterns of Large Polities: Context for Russia". International Studies Quarterly. 41 (3): 475–504. doi:10.1111/0020-8833.00053. JSTOR 2600793. Retrieved 16 September 2016. ^ Thierry, Lentz. "The Proclamation of Empire by the Sénat Conservateur". napoleon.org. Fondation Napoléon. Retrieved 15 August 2014. 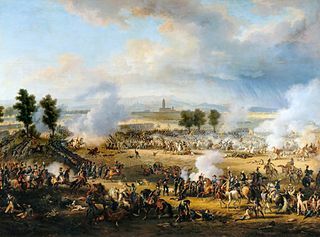 ^ "Battle of Austerlitz". Britannica.com. Encyclopædia Britannica. Retrieved 15 August 2014. ^ Hickman, Kennedy. "Napoleonic Wars: Battle of Friedland". militaryhistory.about.com. about.com. Retrieved 15 August 2014. ^ Haine, Scott (2000). The History of France (1st ed.). Greenwood Press. p. 92. ISBN 978-0-313-30328-9. ^ Chandler, David G. (2000). Napoleon. Pen and Sword. p. 57. ISBN 978-1473816565. Lefebvre, Georges (1969). Napoleon; from Tilsit to Waterloo, 1807–1815. Columbia University Press. Pope, Stephen (1999). The Cassel Dictionary of the Napoleonic Wars. Cassel. ISBN 978-0-304-35229-6. Englund, Steven (2010). Napoleon: A Political Life. Scribner. ISBN 978-0674018037. 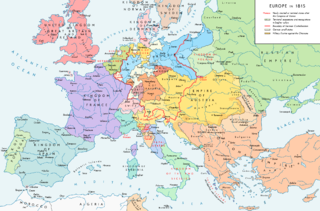 The Congress of Vienna, also called Vienna Congress, was a meeting of ambassadors of European states chaired by Austrian statesman Klemens von Metternich, and held in Vienna from November 1814 to June 1815, though the delegates had arrived and were already negotiating by late September 1814. 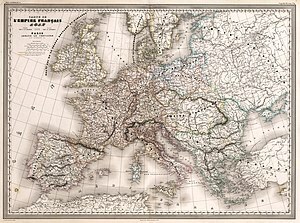 The objective of the Congress was to provide a long-term peace plan for Europe by settling critical issues arising from the French Revolutionary Wars and the Napoleonic Wars. The goal was not simply to restore old boundaries but to resize the main powers so they could balance each other and remain at peace. The leaders were conservatives with little use for republicanism or revolution, both of which threatened to upset the status quo in Europe. France lost all its recent conquests while Prussia, Austria and Russia made major territorial gains. Prussia added smaller German states in the west, Swedish Pomerania and 60% of the Kingdom of Saxony; Austria gained Venice and much of northern Italy. Russia gained parts of Poland. The new Kingdom of the Netherlands had been created just months before, and included formerly Austrian territory that in 1830 became Belgium. Charles-Maurice de Talleyrand-Périgord, 1st Prince of Benevento, then 1st Duke of Talleyrand, was a French politician and diplomat. After theology studies, he became in 1780 Agent-General of the Clergy and represented the Catholic Church to the French Crown. He worked at the highest levels of successive French governments, most commonly as foreign minister or in some other diplomatic capacity. His career spanned the regimes of Louis XVI, the years of the French Revolution, Napoleon, Louis XVIII, and Louis-Philippe. Those he served often distrusted Talleyrand but, like Napoleon, found him extremely useful. The name "Talleyrand" has become a byword for crafty, cynical diplomacy. The Battle of Friedland was a major engagement of the Napoleonic Wars between the armies of the French Empire commanded by Napoleon I and the armies of the Russian Empire led by Count von Bennigsen. Napoleon and the French obtained a decisive victory that routed much of the Russian army, which retreated chaotically over the Alle River by the end of the fighting. The battlefield is located in modern-day Kaliningrad Oblast, near the town of Pravdinsk, Russia. The Napoleonic era is a period in the history of France and Europe. It is generally classified as including the fourth and final stage of the French Revolution, the first being the National Assembly, the second being the Legislative Assembly, and the third being the Directory. The Napoleonic era begins roughly with Napoleon Bonaparte's coup d'état, overthrowing the Directory, establishing the French Consulate, and ends during the Hundred Days and his defeat at the Battle of Waterloo. The Congress of Vienna soon set out to restore Europe to pre-French Revolution days. Napoleon brought political stability to a land torn by revolution and war. He made peace with the Roman Catholic Church and reversed the most radical religious policies of the Convention. In 1804 Napoleon promulgated the Civil Code, a revised body of civil law, which also helped stabilize French society. The Civil Code affirmed the political and legal equality of all adult men and established a merit-based society in which individuals advanced in education and employment because of talent rather than birth or social standing. The Civil Code confirmed many of the moderate revolutionary policies of the National Assembly but retracted measures passed by the more radical Convention. The code restored patriarchal authority in the family, for example, by making women and children subservient to male heads of households. In the War of the Sixth Coalition, sometimes known in Germany as the War of Liberation, a coalition of Austria, Prussia, Russia, the United Kingdom, Portugal, Sweden, Spain and a number of German States defeated France and drove Napoleon into exile on Elba. After the disastrous French invasion of Russia of 1812, the continental powers joined Russia, the United Kingdom, Portugal and the rebels in Spain who were already at war with France. The War of the Second Coalition (1798–1802) was the second war on revolutionary France by the European monarchies, led by Britain, Austria and Russia, and including the Ottoman Empire, Portugal, Naples, various German monarchies and Sweden. Their goal was to contain the expansion of the French Republic and to restore the monarchy in France. They failed to overthrow the revolutionary regime and French territorial gains since 1793 were confirmed. In the Treaty of Lunéville in 1801, France held all of its previous gains and obtained new lands in Tuscany, Italy, while Austria was granted Venetia and the Dalmatian coast. Britain and France signed the Treaty of Amiens in March 1802, bringing an interval of peace in Europe that lasted for 14 months. By May 1803 Britain and France were again at war and in 1805 Britain assembled the Third Coalition to resume the war against France. The War of the Fifth Coalition was fought in 1809 by a coalition of the Austrian Empire and the United Kingdom against Napoleon's French Empire and Bavaria. Major engagements between France and Austria, the main participants, unfolded over much of Central Europe from April to July, with very high casualty rates for both sides. Britain, already involved on the European continent in the ongoing Peninsular War, sent another expedition, the Walcheren Campaign, to the Netherlands in order to relieve the Austrians, although this effort had little impact on the outcome of the conflict. After much campaigning in Bavaria and across the Danube valley, the war ended favourably for the French after the bloody struggle at Wagram in early July. The Battle of Paris was fought on March 30–31, 1814 between the Sixth Coalition, consisting of Russia, Austria, and Prussia, against the French Empire. After a day of fighting in the suburbs of Paris, the French surrendered on March 31, ending the War of the Sixth Coalition and forcing Emperor Napoleon to abdicate and go into exile. Alexander I was the Emperor of Russia between 1801 and 1825. He was the eldest son of Paul I and Sophie Dorothea of Württemberg. Alexander was the first king of Congress Poland, reigning from 1815 to 1825, as well as the first Russian Grand Duke of Finland, reigning from 1809 to 1825. In Northern European historiography, the term French period refers to the period between 1794 and 1815 during which most of Northern Europe was controlled by Republican or Napoleonic France. The exact duration of the period varies by the location concerned. The Acte de déchéance de l'Empereur is a legislative decision taken by the Sénat conservateur on 2 April 1814, recognising the downfall of Napoléon I of France.